NASHVILLE, TN.–What becomes of immigrants and refugees in Nashville following recent executive orders by the Trump administration was the concern of a crowd of more than 150 at a recent forum sponsored by the West End Synagogue and introduced by Vice Mayor David Briley. Rabbi Joshua Kullock quoted a parable of the good Samaritan in the Bible as an example of mercy toward the “travelers lying wounded by the side of the road.” He asked the crowd why they thought a rabbi was quoting from Christian scripture. “The diversity of Tennessee requires us to get out of our comfort zone and learn about each other’s culture. Christians, Jews, Muslims, brown, yellow, black and white people have to learn more about each other. By getting familiar with these differing religious texts, we can see how we are the same–we can discover the divine image we all carry,” said Rabbi Kullock. Greg Siskind, an attorney in immigration law, traced increasingly stricter U.S. laws on immigration and refugees from laws allowing 140,000 Holocaust survivors, to the 1979 Refugee Act when 200,000 refugees were allowed in. “We are now arguing over whether to let 50 -70,000 refugees in – a much smaller number,” Siskind said. “Tennessee has become a test ground for anti-immigrant and anti-refugee laws,” said Stephanie Teatro of the Tennessee Immigrant and Refugee Rights Coalition. Kellye Branson of Catholic Charities, the organization that helps to settle refugees and find them jobs described the screening process refugees go through. “First they are interviewed by UN people. They are screened by the FBI, CIA, Homeland Security and checked against international data bases on criminal activity. They have finger prints taken and their iris scanned. But, if screeners have a bad feeling about a person, they can still say no. One third of people who are screened are not approved,” Branson said. Branson said that money to settle refugees does not come out state budgets. “Our two Senators have played an important role of being moderates,” said Siskind. Kitty Calhoon, co-chair of temple’s social action committee explained why the temple sponsored the meeting. 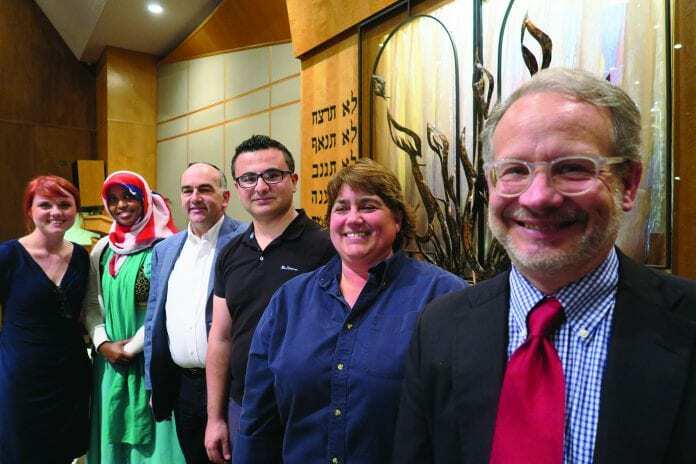 “The Jewish experience of persecution and immigration has made the synagogue interested in providing a space where people can find out about a subject surrounded by so much rumor and fear,” she said.